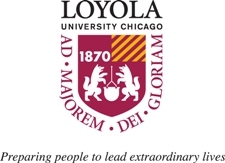 Loyola Chicago’s ACE Program present an event for students, by students. 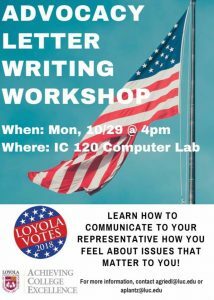 Learn how to communicate to your representative how you feel about issues that matter to you! Join ACE and the Libraries Monday, October 29th in IC 120 at 4pm for this informative workshop and come away with the confidence to have your voice heard by your representatives. For more information, contact agriedl@luc.edu or aplantz@luc.edu or click here to view the facebook event. Sponsored by ACE, the Loyola Libraries, and Loyola Votes 2018. This entry was posted on October 24, 2018 at 9:02 am and is filed under Events, News. You can follow any responses to this entry through the RSS 2.0 feed.